The possibility that mycobacterial infections induce variant cytokine mRNA encoding a functionally distinct protein for immune regulation has not been addressed. In this study, we reported that Mycobacterium tuberculosis and bacillus Calmette-Guérin infections of macaques induced expression of variant IL-4 (VIL-4) mRNA encoding a protein comprised of N-terminal 97 aa identical with IL-4, and unique C-terminal 96 aa including a signaling-related proline-rich motif. While VIL-4 could be stably produced as intact protein, the purified VIL-4 induced apparent expansion of phosphoantigen (E)-4-hydroxy-3-methyl-but-2-enyl pyrophosphate (HMBPP)-specific Vγ2Vδ2 T cells in dose- and time-dependent manners. The unique C-terminal 96 aa bearing the proline-rich motif (PPPCPP) of VIL-4 appeared to confer the ability to expand Vγ2Vδ2 T cells, since simultaneously produced IL-4 had only a subtle effect on these γδ T cells. Moreover, VIL-4 seemed to use IL-4R α for signaling and activation, as the VIL-4-induced expansion of Vγ2Vδ2 T cells was blocked by anti-IL-4R α mAb but not anti-IL-4 mAb. 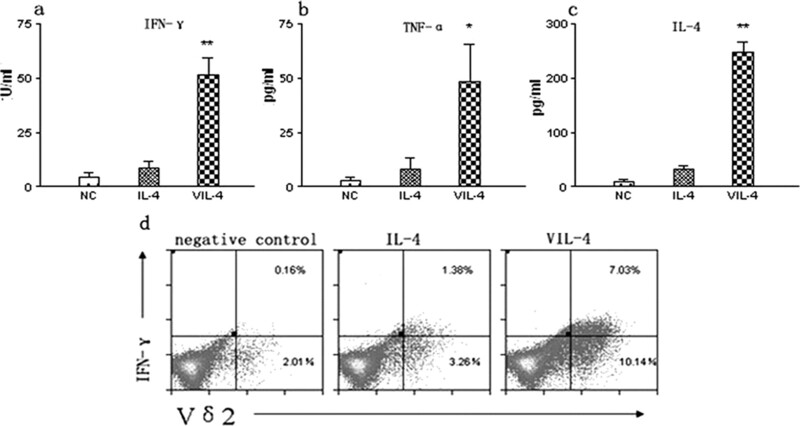 Surprisingly, VIL-4-expanded Vγ2Vδ2 T cells after HMBPP stimulation appeared to be heterologous effector cells capable of producing IL-4, IFN-γ, and TNF-α. Thus, mycobacterial infections of macaques induced variant mRNA encoding VIL-4 that functions as growth factor promoting expansion of HMBPP-specific Vγ2Vδ2 T effector cells. Human IL-4 is a mature glycoprotein of 129 aa, mostly secreted by activated T cells (1), mast cells (2), and basophils (3). It stimulates a wide variety of biological effects in cells of hematopoietic or nonhematopoietic origin (4). IL-4 serves as the critical element in the induction of Th2 response and blocks some of the effects of IL-2, whereas IL-4 immune function can be attenuated by IFN-γ (5). Human IL-4 RNA can undergo alternative splicing of exon 2 and result in a naturally occurring splice variant IL-4 (VIL-4)3 comprised of only exons 1, 3, and 4 (6). The protein isoform of IL-4 (IL-4δ2) encoded by VIL-4 mRNA has a totally different function, as it inhibits the ability of human IL-4 to act as a T cell-costimulator (7, 8), antagonizes the capacity of B cells to synthesize IgE and express CD23, and blocks inhibitory action of IL-4 on LPS-induced cyclooxygenase-2 expression and subsequent PG2 secretion in monocytes (9). However, it is not known whether other splice variants of IL-4 may develop during microbial infections. Vγ2Vδ2 (also called Vγ9Vδ2) T cells exist only in primates and in humans constitute 60–95% of total circulating γδ T cells. Vγ2Vδ2 T cells may play a role in mediating immunity against microbial pathogens and tumors (10, 11, 12). Vγ2Vδ2 T cells can be specifically activated by certain low m.w. foreign- and self-nonpeptidic phosphorylated metabolites of isoprenoid biosynthesis (e.g., (E)-4-hydroxy-3-methyl-but-2-enyl pyrophosphate (HMBPP) and isopentenyl pyrophosphate) (13, 14, 15, 16). HMBPP is produced in the isoprenoid biosynthesis pathway of a number of microbes and is the most potent Vγ2Vδ2 T cell stimulator identified to date (13, 17). We have recently demonstrated that HMBPP is associated with the APC membrane and recognized by Vγ2Vδ2 TCR (18), and that HMBPP and IL-2 cotreatment can induce prolonged antimicrobial and cytotoxic responses of systemic and pulmonary Vγ2Vδ2 T cells (19, 20). Although HMBPP-specific Vγ2Vδ2 T cells can undergo extraordinary transendothelial migration and interstitial localization in tissues during Mycobacterium tuberculosis infection, the ability of these cells to rapidly expand is associated with the immunity against acutely fatal tuberculosis in juvenile rhesus monkeys (20, 21). It is, therefore, important to elucidate immune biology of Vγ2Vδ2 T cells in the context of various cytokines. Although human IL-4 has minor or no effect on HMBPP-stimulated Vγ2Vδ2 T cells (22, 23), IL-2, IL-15, and IL-21 have been shown to promote major expansion of Vγ2Vδ2 T cells in response to stimulation with phospholigands (14, 23). Given the possibility that in vivo expansion of Vγ2Vδ2 T cells in response to microbes may be driven by a variety of cytokines, some splice variant mRNAs encoding isoforms of IL-4 or other lymphokines might also develop and contribute to regulation of HMBPP-specific Vγ2Vδ2 T cells. We have recently initiated studies examining many immune genes encoding cytokines or immune proteins at the time Vγ2Vδ2 T cells expand remarkably during mycobacterial infections (20, 24). In the present study, we reported that a variant mRNA encoding a cytokine protein, which consisted of N-terminal 97 aa identical with IL-4 and unique C-terminal 96 aa, was induced in M. tuberculosis and bacillus Calmette-Guérin (BCG) infection of macaques. Interestingly, the VIL-4 could be stably expressed and purified, and functioned as growth factor promoting expansion of Vγ2Vδ2 T cells in response to HMBPP. The unique C-terminal 96 aa bearing a proline-rich motif appeared to confer the ability to expand HMBPP-stimulated Vγ2Vδ2 T cells. VIL-4 used IL-4R α for signaling and activation. Surprisingly, VIL-4-expanded Vγ2Vδ2 T cells appeared to be heterologous effector cells that were capable to produce IL-4, IFN-γ, and TNF-α. Four- to 8-year-old, 3–8 kg, rhesus macaques (Macaca mulatta) and cynomolgus macaques (Macaca fascicularis) were used in this study. All animals were maintained and used in accordance with guidelines of the institutional animal care and use committee. For M. bovis BCG infection, naive or SIVmac-infected rhesus monkeys were inoculated i.v. with 108 CFU of BCG Pasteur strain as previously described (25). For the pulmonary infection of cynomolgus monkeys, 1000 CFU of M. tuberculosis Erdman in 2 ml PBS were administered to each monkey by bronchoscope into the right caudal lung lobe, as previously described (20). PBMC were isolated from EDTA-anticoagulated blood of the monkeys using Ficoll/diatrizoate gradient centrifugation. Single-cell suspensions were obtained from pieces of spleens and lymph nodes through mincing as previously described (20, 25). RNA isolation and cDNA synthesis were done using the protocol as previously described (24). For the initial identification of BCG-induced expression of VIL-4 RNA, one-round PCR was done. For identification of tuberculosis-induced VIL-4, two rounds of PCR were conducted as previously described (26). The primers used for first-round PCR were: Ext 5-IL4, TGCTGCCTCCAAGAACACAACTGA; and Ext 3-IL4, CAACGTACTCTGGCTGGCTTCCTT. The primer used for second-round PCR were: Int 5-IL4, AGGGCTGCGACTGTGCTC; and Int 3-IL4, CGTACTCTGGCTGGCTTCCT. The first round PCR yielded DNA products of 380 bp for VIL-4 and 229 bp for IL-4, whereas the second round PCR generated DNA products of 337 bp for VIL-4 and 186 bp for IL-4. PCR conditions were as follows: 94°C, 2 min→ (94°C, 20s → 60°C, 20s → 72°C, 40s) × 32 cycles →72°C, 7 min. The full-length VIL-4 and IL-4 cDNA were isolated from the total cellular cDNA by PCR using a 5′ primer in the beginning of the VIL-4 leader sequence and a 3′ poly(A) primer. Full-length IL-4 and VIL-4 cDNA isolated by PCR were subcloned into BamHI and SalI sites of the plasmid pET-30a(+) from Novagen using the PCR-based cloning method. Positive recombinant plasmids transformed to Escherichia coli B21 were selected by their anti-Kanamycin (Fisher Biogeagents), characterized by BamhI and SalI digestion, and confirmed by DNA sequencing (preformed by DNA Services Facility, Research Resources Center, University of Illinois, and deduced amino acid sequences of IL-4 and VIL-4 were analyzed by bioinformatics tools at the World Wide Web molecular biology server: http://us.expasy.org; http://www. ncbi.nlm.nih.gov; and DNA MAN 4.0 (Lynnon Biosoft) software). E. coli BL21/pET-30a(+)/IL-4 and E. coli. BL21/pET-30a(+)/VIL-4 were induced for protein expression by isopropyl β-d-thiogalactoside at final concentration of 0.8M/ml overnight at 28°C. SDS-PAGE gel was run to identify desired protein. Expressed protein was purified initially by Ni-NTA agarose (Qiagen) according to manufacturer’s instruction under native condition with 10 mM imidazole in binding buffer, 20 mM imisazole in wash buffer, and 250 mM imisazole in elusion buffer. The pH value of all buffers was 8.0. The protein was further purified by Biologic Duoflow Chromatography system (Bio-Rad). We used MultiIdent tool (http://us.expasy.org) to identify pI values of IL-4 and VIL-4, which were 9.39 and 9.10, respectively. Based on the pI, Cation Exchange column (MonoBeads column; Amersham Biosciences) was chosen but undesired proteins were high. Thus, Anion Exchange column (1 ml, Resource Q column; Amersham Biosciences) was used to collect unbound protein with start buffer (Buffer A (pH 8.0), 20 mM Na2HPO4 plus 50 mM NaCl) and elution buffer (Buffer B (pH 8.0), 20 mM Na2HPO4 plus 1 M NaCl). Before loading, protein samples were dialyzed in start buffer overnight. Loading sample was 0.5 ml Ni-NTA agarose purified IL-4/VIL-4 with 0.5 ml start buffer. Protocol was described as below; the flow rate for this experiment was 1 ml/min (Table I⇓). After each run, column was washed by ddH2O; 1 M NaCl; 1 M NaHO; 10% HCl; 1 M NaCl and ddH2O, respectively, each for 15 min. Pepsin (1 mg/ml) was used to wash column every the other run to remove bound protein, which could hardly be eluted by elution buffer. All buffer were filtered through 0.22 μm filter (Millipore). Collected protein samples were concentrated and then subjected to SDS-PAGE. BCA Protein Assay Kit (Pierce) was used to quantify purified protein following manufacturer’s instruction. Trypsin inhibitor form Glycine max (Sigma-Aldrich) with molecular mass at 21 kDa was diluted at 200 ng/ml and used as positive control. Concentrations of purified proteins were calculated according to the standard curve by using software SigmaPlot 10.0. Dot blot and Western blot were performed according to standard protocol. Because of unavailability of an Ab specifically recognizing VIL-4, both proteins were assessed using mouse anti-human IL-4 mAb, which was developed by immunizing mice using recombinant human IL-4 expressed in E. coli as immunogen. In this experiment, E. coli BL21 pET-30a(+) protein purified by Ni-NTA column was used as negative control. In dot blot, 10 μl negative control and 2 ng IL-4 and 3 ng VIL-4 protein samples were loaded on methanol-treated polyvinylidene difluoride membrane (0.45μ; Millipore); in Western blot, 1–5 ng of IL-4 and 1.5–7.5 ng of VIL-4 were loaded to run SDS-PAGE then transform to same polyvinylidene difluoride membrane by using Trans-Bloc SemiDry system (Bio-Rad). Then membranes were blocked in SuperPBS blocking buffer (Pierce) overnight at 4°C. Anti-human IL-4 Ab was diluted at 1/1000 and incubated with membrane for 2 h at room temperature. After washing, membranes were incubated with goat anti-mouse HRP-conjugated Ab (Bio-Rad) at dilution of 1/2000 for 1 h at room temperature. After washing as before, membranes were developed by Supersignal WestPico Chemiluminescence substrate (Pierce) then exposed to BioMax MR film (Kodak). No detectable deletion of expressed proteins was found as IL-4 and VIL-4 proteins were readily purified through the His-tag, and the purified IL-4 and VIL-4 proteins on the SDS-PAGE gel were consistent with the predicted molecular weights of ∼20 kDa (IL-4) and ∼25 kDa (VIL-4), respectively (Fig. 2b). The purified IL-4 and VIL-4 proteins were also recognized by anti-IL-4 Ab (Fig. 2, d and e). Finally, the macaque IL-4/VIL-4 actually shared with human IL-4 the capability to stimulate B cell proliferation and to help to promote monocytes to dendritic cells in culture (data not shown). The cell-culture system for activation and expansion of Vγ2Vδ2 T cells in PBMC using phosphoantigen and cytokines were used as previously described (21). In brief, PBMC were isolated from the heparinized blood of healthy uninfected or BCG-infected rhesus macaques by Ficoll/Hypaque density gradient centrifugation as previously described (25). PBMC were stimulated for 3 days with 50 ng/ml HMBPP, and then cultured for an additional 3 or 7 days in the presence of different concentrations of purified IL-4 (1, 5, 10, 20, 40, and 60 ng) or VIL-4 (1.5, 7.5, 15, 30, 60, and 90 ng). Every 2–3 days, the same concentrations of IL-4 or VIL-4 were added to the culture. HMBPP alone or cytokine alone in the cell culture served as negative controls; 20 U human IL-2 (Sigma-Aldrich) were used as positive control during all experiments. At day 10, cells were harvested, and stained with fluorescence-conjugated anti-Vγ2, anti-Vδ2, and anti-CD3 mAbs and analyzed by flow cytometry. In all experiments, cells were cultured in 96-well plates at 2 × 105 cells/well in a total volume of 0.2 ml/well in the condition of 37°C, 5% CO2. VIL-4 was able to induce proliferation of human Vγ2Vδ2 T cells in culture (data not shown). No bio-activities expanding Vγ2Vδ2 T cells were detected for the control culture from the E. coli BL21/pET-30a only (without IL-4 or VIL-4 gene), which was purified and concentrated side by side with the IL-4 or VIL-4 culture. No detectable expansion of Vγ2Vδ2 T cells were seen in the cultures using “sequence/content” protein controls of recombinant IFN-γ or 25mer PPPCPP-motif-containing peptide of VIL-4 (data not shown). After harvesting, cells were washed with 5% FBS-PBS and surface markers were stained with respective mouse anti-human mAbs for 15 min. After staining, cells were washed two times and fixed with 2% formaldehyde-PBS (Protocol Formalin) before analysis on a CyAn ADP flow cytometer (DakoCytomation). Lymphocytes were gated based on forward- and side-scatters, and pulse-width and at least 40,000 gated events were analyzed using Summit Data Acquisition and Analysis Software (DakoCytomation). The following conjugated Abs were used in different combinations: FITC-labeled anti-human TCR Vγ2 mAb (clone number 7A5) and anti-human TCR Vδ2 mAb (clone number 15D) with or without FITC labeling, purchased form Pierce; APC-labeled mouse anti-human CD3 mAb (clone number SP34-2), PE-labeled mouse anti-human IFN-γ mAb (clone number 4S.B3), purchased form BD Biosciences; APC-labeled mouse anti-human CD8 mAb (clone number DK25), purchased form DakoCytomation; Pacific Blue-labeled mouse anti-human CD4 mAb (clone number OKT4), purchased form eBioscience. Mouse anti-human IL-4 mAb was generated and provided by Sigma-Aldrich using as immunogen the recombinant human IL-4 expressed in E. coli. Mouse anti-human IL-4Rα mAb (anti-human CD124 (clone number DK25)) were purchased form Santa Cruz Biotechnology. PE or APC-conjugated goat F(ab′)2 anti-mouse IgG(Fcγ) from Beckman Coulter were used as secondary Abs for indirect staining. PBMCs were stimulated first with HMBPP, and then cultured with 10 ng IL-4 or 15 ng VIL-4 in the presence or absence of different concentrations of mouse anti-human IL-4 mAb (1, 2, 4, and 8 μg/ml) or anti-IL-4Rα mAb (0.2, 0.5, 1, and 2 μg). The anti-IL-4 mAb was the same as that used in dot blot and Western blot assay. The earlier experiment showed that IL-4 receptor α-chain could be expressed on Vγ2Vδ2 T cells (data not shown). PBMCs from monkeys were cultured in the presence or absence HMBPP/IL-4 or HMBPP/IL-4 as described above. At day 10, supernatant was collected for ELISA, and cells were used for intracellular cytokine staining. IFN-γ, TNF-α, or IL-4 levels in culture supernatant were measured by double sandwich ELISA following the manufacturer’s direction. (BD Biosciences, monkey IFN-γ ELISA set, human TNF-α, and human IL-4 ELISA set). To ensure that IL-4 detected in supernatant reflected the IL-4 produced naturally by HMBPP-stimulated VIL-4-expanded γδ T cells but not rIL-4 or VIL-4 that we added to the cell culture, PBMC culture in wells of the same plate were incubated with same amounts of IL-4 or VIL-4 under the same conditions as experimental groups. The background reading was subtracted when analyzing data. Concentrations of cytokine in supernatant of experimental groups were calculated according the standard curve by using Microsoft Excel tools. Cells were washed with 5% FBS-PBS. In brief, 106 cells plus costimulatory mAbs CD28 and CD49, 1 μg/ml each, were incubated with HMBPP in 200 μl final volume for 1 h, followed by an additional 5 h incubation in the presence of 1 μl GolgiPlug (BD Biosciences) to enhance intracellular cytokine accumulation. Cells were washed and stained with surface marker Vδ2-FITC and CD3-APC, then were permeabilized (Cytofix/Cytoperm, BD Biosciences) for 45 min. Intracellular IFN-γ were stained for 45 min, then resuspended in 2% formaldehyde-PBS for flow cytometric analysis. Statistical analysis was done using Student’s t test as previously described (21). We have recently demonstrated that many immune genes, including the IL-4 gene, are up-regulated in lymphocytes during BCG and M. tuberculosis infections (20, 27). In a complementary study, we screened alternatively spliced cytokine mRNAs in mycobacterial infection using a PCR-based screening strategy that used paired primers designed based on sequences of exon(s) and 3′ untranslated regions of cytokine genes. We found that IL-4 cDNA isolated by PCR from the spleen lymphocytes of two of six BCG-infected rhesus monkeys contained one extra fragment that was ∼200 bp bigger than the predicted IL-4 cDNA on the agarose gel (Fig. 1⇓a), suggesting that BCG infection induced a variant IL-4 mRNA. Similarly, M. tuberculosis infection appeared to induce such variant IL-4 mRNA as well, since such a larger-size IL-4 fragment was also amplified by PCR from cDNA derived from spleen lymphocytes collected from four of eight M. tuberculosis-infected cynomolgus monkeys (Fig. 1⇓b). The PCR-based cloning approach using a new 5′ primer for IL-4 leader sequence and a 3′ poly-A primer allowed us to confirm the existence of the full-length variant IL-4 mRNA (Fig. 1⇓, c and d). For simplicity purpose, we temporarily termed this variant mRNA or protein as VIL-4. BCG and M. tuberculosis infection induced expression of variant IL-4 mRNA (VIL-4), which encoded a cytokine protein comprised of 97 aa identical with IL-4 at N-terminal and unique 96 aa including a signaling-related proline-rich motif at C-terminal. a, The agarose gel showed PCR products of VIL-4 (marked by an arrow) and IL-4 cDNA derived from cells isolated from spleens of two BCG-infected monkeys. Numbers on top indicate PCR samples ID. Numbers 1–3 were PCR products of cDNA derived from the monkey 278; number 3 was the sample from lymphocytes of the spleen with TB-like granulomatous lesions 2 years after BCG/SIVmac coinfection, whereas numbers 1–2 were the samples from PBMC and BAL obtained on 4 wk, respectively, after BCG infection. Numbers 4–6 were PCR products from cDNA derived from the monkey 276, with the same sample orders as Numbers 1–3. Number 7 was negative control for PCR. 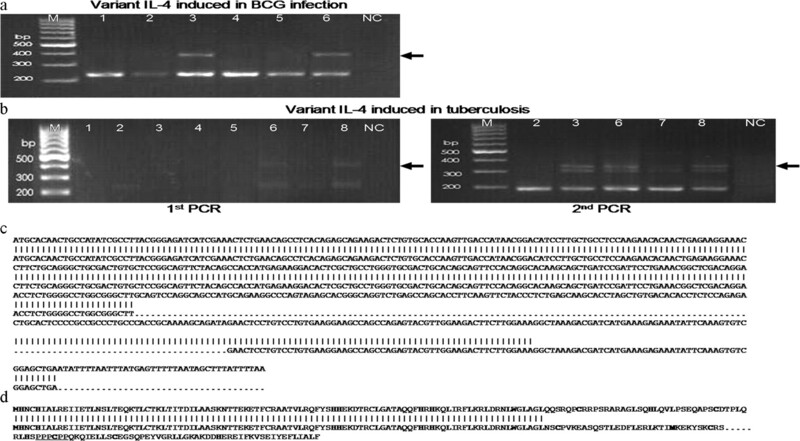 No VIL-4 were amplified by PCR in samples from the other four BCG-infected monkeys. b, The agarose gels showed first-round (left) and second-round (right) PCR products of VIL-4 (marked by an arrow) and IL-4 cDNA from spleen lymphocytes of eight monkeys infected 2–5 mo with M. tuberculosis. Numbers 1–8 were samples from monkeys FB32, 33, 35, 36, 37, 38, 43, and 45, respectively. The first-round PCR primers yielded 380-bp VIL-4 (marked by an arrow) and 229-bp IL-4 fragments after amplification of samples Number 6 and 8; the second-round PCR primers amplified 337-bp VIL-4 (marked by an arrow) and 186-bp IL-4 fragments. NC, negative control for PCR. Sequencing of the 380-bp or 337-bp fragment from difference monkeys showed the same VIL-4 sequence. The lower band next to the VIL-4 fragment was an untranslatable IL-4 variant. The PCR-based cloning approach using a new 5′ primer for IL-4 leader sequence and a poly-A 3′ primer confirmed the existence of the variant sequence of IL-4, as shown in c. c, VIL-4 DNA sequence had two insertions: the 151 bp insertion was introduced right between the third and fourth exons of IL-4 gene, and positioned from 292 through 443; the second insertion containing 38 bp joined from the downstream of the fourth exon through the 3′ terminal. Both inserted parts shared a homology of 94% with Homo sapiens chromosome 5 genomic sequence of IL-4 intron. d, VIL-4 shared identical 97 residues with IL-4 at N-terminal, but displayed 96 different amino acid sequences thereafter in the downstream due to the open reading-frame shift caused by the 151 bp insertion. Note that there is a proline-rich motif (PPPCPP) as underlined at the position from 137 through 142 at the C-terminal of VIL-4. We then used human IL-4 gene organization and sequence to analyze wild-type IL-4 and VIL-4 cDNA isolated from PBMC of BCG-infected monkeys; sine humans and nonhuman primates shared a 94.8% homology in IL-4 sequences (28). Wild-type IL-4 cDNA was 393 bp; VIL-4 was 582 bp (the length spanning start and stop codons). Based on the germline and cDNA sequences of human IL-4 (29), macaque VIL-4 cDNA carried two insertions: the 151-bp insertion was introduced right between the third and fourth exons of IL-4 gene, and positioned from 292 through 443. This insertion shared a 94% similarity in sequence with a fragment of IL-4 intron in human chromosome 5 genome. The second insertion containing 38 bp appeared to be derived from the germline and joined the fourth exon (Fig. 1⇑b). Interestedly, the 151 bp insertion caused frame-shift of the exon 4 sequence and encoded unique protein sequence. Thus, VIL-4 carried 193 aa residues, where IL-4 consisted of 130 aa residues. The 193-aa-long VIL-4 shared identical N-terminal 97 aa with IL-4 from the leader through the exon 3, with unique 96 aa at C-terminal (Fig. 1⇑c). Surprisingly, VIL-4, not IL-4, carried a proline-enriched motif (PPPCPP) at the position of 137–142 at the C-terminal, which might involve protein-protein interaction for signaling (Fig. 1⇑c). Given the importance of three disulfide bridges for structure and function of human IL-4 (30), we used the Disulfide software (31) to predict the disulfide bridges of macaque VIL-4 and IL-4. Although macaque IL-4 shared exactly same disulfide bridges as human IL-4, VIL-4 had a total of eight cysteines in the coding sequence. Four of the eight cysteines might form disulfide bonds: Cys3-Cys127; Cys24-Cys46; Cys65-Cys140 and Cys102-Cys151. The software-based analysis showed that only the first disulfide bridge (Cys3-Cys127) of VIL-4 was the same as that of IL-4, potentially connecting N- and C-termini of IL-4 for a loop formation. However, because VIL-4 sequence was much longer than IL-4, this bridge may or may not connect the N- and C-termini of VIL-4. Thus, VIL-4 may have different structures from IL-4, and that VIL-4 may have different function due to the unique structure. Although the human IL-4 contains two potential sites for glycosylation, carbohydrate do not seems to be required for its biological activity (32, 33, 34). We therefore chose E. coli expression system to express macaque IL-4 and VIL-4. Both IL-4 and VIL-4 were expressed in E. coli BL21. For purification purpose, His tag was introduced at the N-terminal of IL-4 or VIL-4. After Ni-NTA agarose purification, there were still several undesired protein bands in addition to the predicted IL-4 or VIL-4. To increase purity of IL-4 and VIL-4, we used Biologic Duoflow Chromatography system to further separate proteins. Based on the known chemical features of IL-4, we chose the ion exchange chromatography for further purification. The chromatography using the cation exchange chromatography resulted in precipitation of both IL-4 and VIL-4 in buffer at the defined pH value, and gave rise to several undesired proteins in output. However, the Anion Exchange chromatography at pH 8.0 was quite efficient to separate IL-4 or VIL-4 from other proteins. Because IL-4 or VIL-4 was unable to bind to the column, IL-4 or VIL-4 could readily pass through the column as the first peak while other proteins remained bound to it (Fig. 2⇓a). SDS-PAGE gel showed that IL-4 or VIL-4 collected from the peak 1 was quite pure (Fig. 2⇓b), and that the molecular weights of expressed IL-4-His protein and VIL-4-His proteins were ∼20 and ∼25 KDa, respectively, based on MultiIdent tool computation (Fig. 2⇓b). The BCA Protein Quantitation Assay indicated that purified IL-4 and VIL-4 were 161 μg/ml and 186 μg/ml, respectively (Fig. 2⇓c; control protein was 219 μg/ml). Endotoxin was not detectable in non-concentrated protein preparation purified from the Ni-NTA agarose and Biologic Duoflow Chromatography systems. The Pyrosate (ACC) test kit with a sensitivity of 60 EU/ml was used for the endotoxin test. The availability of purified IL-4 and VIL-4 allowed us to determine whether they shared with the human IL-4 the ability to react with anti-IL-4 mAb and to exert immune function. Both VIL-4 and IL-4 were expressed and purified. VIL-4 or IL-4 protein was first purified by Ni-NTA agarose, and then further purified by an anion exchange column of Biologic Duoflow Chromatography system. a, The unbound Peak 1 fraction collected from the column was either VIL-4 or IL-4 protein. Peaks 2 and 3 fractions represented unknown proteins that were bound to the column and later eluted by elution buffer after the protein in Peak 1 passed through. b, SDS-PAGE analysis showed that both IL-4 (Lane 1) and VIL-4 (Lane 2) were apparently pure after the two-round purification, with each protein exhibiting a single dominant band on the gel. The molecular weights of expressed fusion protein IL-4 and VIL-4 were ∼20 and ∼25 kDa on SDS-PAGE gel. c, Purified IL-4 and VIL-4 were quantified by a BCA Protein Quantitation Assay kit. The result showed that purified VIL-4 was 161 μg/ml; IL-4 was186 μg/ml (control protein was 219 μg/ml). d, 2 ng IL-4 and 3 ng VIL-4 were loaded in the dot blot membrane, and both IL-4 and VIL-4 were recognized by the anti-human IL-4 mAb. e, 3 ng IL-4 and 4.5 ng VIL-4 were run on the SDS-PAGE gel in the Western blot; only IL-4, not VIL-4, was recognized by the anti-human IL-4 mAb. f, Different concentration of IL-4 and VIL-4 were run in the SDS-PAGE gel in a repeated Western blot analysis, and results were same as described above. Loading 1 was negative control, loading 2 was 1 ng IL-4 sample, loading 3 was 1.5 ng VIL-4, loading 4 was 5 ng IL-4, and loading 5 was 7.5 ng VIL-4. Because some anti-human-IL-4 mAbs are widely used to detect soluble IL-4 produced by human and macaque T cells, it would be important to determine whether macaque VIL-4 and IL-4 resemble human IL-4 in structures and in the capacity to be recognized by the anti-IL-4 mAb. In the dot blot assay (nondenature condition for proteins), both macaque VIL-4 and IL-4 were recognized by the anti-human IL-4 mAb (Fig. 2⇑d). In the Western-blot assay (denature condition), however, only IL-4, not VIL-4, was recognized by the anti-IL-4 mAb (Fig. 2⇑e). The additional Western blot characterization using different concentrations of IL-4 and VIL-4 gave rise to same results (Fig. 2⇑, e and f). These results suggested that while VIL-4 shared with IL-4 some features of protein structures that could be recognized by anti-IL-4 mAb, VIL-4 also had its own unique secondary structure that was destructible under the SDS-PAGE denature condition. This scenario might help to explain why denatured condition led to a loss of the recognition of VIL-4 by the anti-IL-4 mAb. The potential unique structure of VIL-4 might confer some immune function that differs from IL-4. Because the VIL-4 mRNA was identified from monkeys during mycobacterial infection, we sought to determine whether VIL-4 protein could exert some immune function. To address this, we took advantage of our well-established system for measuring in vitro Vγ2Vδ2 T cell proliferation/expansion in response to phosphoantigen HMBPP (21). HMBPP alone or VIL-4 alone was not able to induce a detectable expansion of Vγ2Vδ2 T cells in PBMC. However, when PBMC were incubated with 50 ng HMBPP for 3 days, and then cultured with VIL-4 for additional 7 days, Vγ2Vδ2 T cells expanded up to ∼36% from ∼1% in PBMC. In contrast, IL-4 induced only minor expansion of HMBPP-stimulated Vγ2Vδ2 T cells (Fig. 3⇓, a and d). Although VIL-4-induced expansion of Vγ2Vδ2 T cells was dose-dependent, 15–20 ng/ml was the optimal dose for VIL-4 (Fig. 3⇓b). Ten nanograms of IL-4/ml appeared to be the dose exerting minor effect on Vγ2Vδ2 T cells (Fig. 3⇓b). Furthermore, VIL-4-induced expansion of HMBPP-stimulated Vγ2Vδ2 T cells was time-dependent, as the expansion of Vγ2Vδ2 T cells was more evident on day 7 than on day 3 (Fig. 3⇓c). Using 15 ng/ml VIL-4 in the 7-day culture, VIL-4 consistently induced apparent expansion of HMBPP-stimulated Vγ2Vδ2 T cells in PBMC from other monkeys (Fig. 3⇓d). The magnitude of VIL-4-induced expansion of Vγ2Vδ2 T cells was statistically greater than what was seen for the minor increase in Vγ2Vδ2 T cells by IL-4 (Fig. 3⇓e). Thus, these results demonstrated that unique N-terminal 96 aa containing proline-rich motif of VIL-4 appeared to confer the ability of the variant cytokine to promote apparent expansion of Vγ2Vδ2 T cells in response to HMBPP. VIL-4 induced proliferation and expansion of HMBPP-stimulated Vγ2Vδ2 T cells at a dose- and time-dependent manner. a, Flow cytometry histograms from one representative monkey (7289) showed that VIL-4 induced apparent expansion of HMBPP-stimulated Vγ2Vδ2 T cells. PBMC from the monkeys were stimulated with HMBPP for 3 days, cultured with VIL-4 or IL-4 for 7 days, and then assessed for changes in numbers of Vγ2Vδ2 T cells. CD3+ T cells were gated for analysis of HMBPP-stimulated Vγ2Vδ2 T cells. IL-4 induced only minor expansion of HMBPP-stimulated Vγ2Vδ2 T cells. The stimulation with HMBPP only, IL-4 only, or VIL-4 only did not induce detectable expansion of Vγ2Vδ2 T cells. b, VIL-4-induced expansion of HMBPP-stimulated Vγ2Vδ2 T cells was dose-dependent, with an optimal concentration of VIL-4 being 15 ng/ml (10 ng/ml for IL-4). Data were percentage numbers of cells in CD3+ T cells. Shown were representative data from one (7289) of two monkeys in two independent experiments. c, VIL-4-induced expansion of HMBPP-stimulated Vγ2Vδ2 T cells was time-dependent. After a 3-day stimulation with HMBPP, Vγ2Vδ2 T cells were cultured with VIL-4 for 3 or 7 days. Expansion of HMBPP-stimulated Vγ2Vδ2 T cells on day 7 was higher than that on day 3. Shown were representative data from one (7289) of three monkeys in two independent experiments. d, VIL-4-induced expansion of HMBPP-stimulated Vγ2Vδ2 T cells in PBMC form other monkeys. Shown were the data from PBMC stimulated for 3 days with HMBPP and cultured for 7 days with 10 ng IL-4/ml or 15 ng VIL-4/ml. No expansion for the cultures using HMBPP alone, IL-4 alone, or VIL-4 alone (data not shown). e, VIL-4 induced much greater expansion of HMBPP-stimulated Vγ2Vδ2 T cells than IL-4 (p < 0.05). Data were means and SEM values derived from PBMC cultures of six monkeys. The finding that VIL-4 induced apparent expansion of HMBPP-stimulated Vγ2Vδ2 T cells raised an interesting question as to whether VIL-4 functioned through IL-4 receptor for the γδ T cell proliferation and expansion. To address this, we first identified the anti-IL-4 receptor α mAb DK25 (Santa Cruz Biotechnology) that could cross-react with macaque IL-4Rα-chain (CD124). Using this anti-IL-4Rα mAb for blocking experiments, we found that anti-IL-4R mAb was able to block VIL-4-induced expansion of HMBPP-stimulated Vγ2Vδ2 T cells in a dose-dependent manner (Fig. 4⇓a). Interestingly, anti-IL-4 mAb was not able to block VIL-4-induced expansion of HMBPP-stimulated Vγ2Vδ2 T cells (Fig. 4⇓b). The IL-4-mediated minor expansion of Vγ2Vδ2 T cells was blocked by both anti-IL-4R mAb and anti-IL-4 mAb (Fig. 4⇓, a and b). These results therefore implicated that VIL-4 functioned through IL-4Rα in a signaling pathway for expansion of HMBPP-stimulated Vγ2Vδ2 T cells. Anti-IL-4 receptor α-chain mAb blocked VIL-4-induced expansion of HMBPP-stimulated Vγ2Vδ2 T cells. a, Anti-IL-4 receptor α-chain mAb blocked VIL-4-induced expansion of HMBPP-stimulated Vγ2Vδ2 T cells at a dose-dependent manner. b, Anti-IL-4 mAb was not able to block VIL-4-induced expansion of HMBPP-stimulated Vγ2Vδ2 T cells. IL-4-induced minor expansion appeared to be reduced by anti-IL-4 mAb. Data were derived from one of three monkeys in two independent experiments. Note that IL-4-induced minor expansion of Vγ2Vδ2 T cells were blocked by both anti-IL-4 mAb and anti-IL-4 receptor α-chain mAb. Finally, we sought to examine effector function of VIL-4-expanded Vγ2Vδ2 T cells in terms of cytokine production using both the double sandwich ELISA and intracellular cytokine staining. We focused on IFN-γ and TNF-α because they are major cytokines produced by activated Vγ2Vδ2 T cells. Surprisingly, HMBPP-stimulated VIL-4-expanded Vγ2Vδ2 T cells produced large amounts of IFN-γ, TNF-α, and IL-4 in the culture supernatant, compared with the IL-4-treated or medium-only cultures (Fig. 5⇓, a–c; p < 0.05 or p < 0.01). The IFN-γ-producing capacity of HMBPP-stimulated VIL-4-expanded Vδ2 T cells was also demonstrated by intracellular cytokine staining (Fig. 5⇓d). Thus, these results demonstrated that HMBPP-stimulated, VIL-4-expanded Vγ2Vδ2 T cells were heterologous effector cells capable of producing IFN-γ, TNF-α, and IL-4. HMBPP-stimulated VIL-4-expanded Vγ2Vδ2 T cells were heterologous effector cells capable of producing IFN-γ, TNF-α, and IL-4. a–c, showed IFN-γ, TNF-α, and IL-4, respectively, in culture supernatant of HMBPP-stimulated VIL-4-expanded PBMC. These cytokines were measured by double sandwich ELISA. Data were means and SEM values derived from PBMC of four monkeys. Difference in each of cytokines between VIL-4- and IL-4-treated cultures was statistically significant (∗, p < 0.05; ∗∗, p < 0.01). Negative controls, HMBPP treated for 3 days and cultured without VIL-4 or IL-4 for additional 7 days. d, Representative intracellular cytokine staining data indicating that IFN-γ-producing Vδ2+ cells in HMBPP-stimulated VIL-4-expanded PBMC. Shown were the representative data from one of three experiments using PMBC from one of three monkeys. The present study suggests that splice variant IL-4 mRNA can be formed during mycobacterium BCG infection of macaques, although the molecular mechanism for development of VIL-4 mRNA is unclear. Macaque VIL-4 mRNA may be produced through some kind of alternative splicing (35). Many alternative splicing variants including IL-2, IL-4, IL-6, IL-7, and mast cell growth factor have been identified (36, 37, 38, 39). IL-4 alternative splicing takes place not only in humans (6), but also in other species including chimpanzee (40), European rabbit (41), mouse (42), and cattle (43, 44). The fact that VIL-4 mRNA is identified in cells from lymphoid tissues in some M. tuberculosis-infected and BCG-infected monkeys suggests that host factors play a role in selection of such variant mRNA during mycobacterial infection. At this point, we do not have mAb specific for VIL-4, and therefore cannot define VIL-4 protein production in selected immune cells of M. tuberculosis-infected or BCG-infected monkeys. Despite this, however, the VIL-4 cDNA can be expressed and purified as intact protein in the in vitro expression system. More importantly, VIL-4 protein, but not IL-4, can promote apparent expansion of Vγ2Vδ2 T cells in response to HMBPP. Now that VIL-4 protein can be produced and purified, it is possible to develop VIL-4-specific Abs and assess potential production of VIL-4 by macaque immune cells during mycobacterial infection. VIL-4 differs from IL-4 in the length and C-terminal amino acids and possesses two unique structural features: 1) VIL-4 carries a proline-rich motif; and 2) VIL-4 is different from IL-4 regarding structural disulfide bridges. Although a proline-rich protein could be considered as an “adaptor” bringing together other proteins, this peptide recognition motif or module can mediate protein-protein interaction critical for the assembly of complex and pathways that coordinate specific biochemical functions (45). Domains that bind to proline-rich motifs have been shown to assemble many intracellular signaling complexes and pathways (46). In fact, SH3, WW, and EVH1 domains recognize proline-rich peptides, which involve in signaling pathways (47, 48). Thus, the proline-rich motif (PPPCPP) at the C-terminal of VIL-4 may involve in a signaling pathway driving proliferation and expansion of Vγ2Vδ2 T cells. In addition to the proline-rich motif, the difference in structures or disulfide bridges between VIL-4 and IL-4 may also contribute to VIL-4-induced proliferation and expansion of Vγ2Vδ2 T cells. Structurally, human IL-4 belongs to the group of short-chain four helix-bundle cytokines (49). It contains three disulfide bridges, Cys3-Cys127, Cys24-Cys65, and Cys46-Cys99, with no free cysteines. The N- and C-termini of the IL-4 protein are connected by the Cys3-Cys127 disulfide bond; Cys24-Cys65 links the two long loops AB and BC and Cys46-Cys99 joins loop CD to helix B (50, 51). The crucial role of the six cysteines of three disulfide bridges in IL-4 structure and function has been implicated, as replacements by site-directed mutagenesis result in a nearly complete loss of biological activity and unstable protein (30). We presume that the three disulfide bridges are also crucial in macaques IL-4 as it shares exactly the same cysteines with human IL-4. However, based on the Disulfide Software prediction, VIL-4 does not have the second and third disulfide bridges of IL-4. Even the first disulfide bridge may or may not be formed to connect the N- and C-termini of VIL-4, as VIL-4 is 63 residues longer than IL-4. The difference in disulfide bridges of VIL-4 may contribute to its capability to expand Vγ2Vδ2 T cells. One of the interesting observations regarding VIL-4 function is that VIL-4 is able to drive proliferation and expansion of Vγ2Vδ2 T cells in response to HMBPP. This is quite in contrast to macaque IL-4, since macaque IL-4, like human IL-4 (22, 23), has only minor effect on expansion of HMBPP-stimulated Vγ2Vδ2 T cells. These findings suggest that the unique 96 aa sequence including the proline-rich motif at C-terminal of VIL-4 confers the ability of VIL-4 to promote expansion of Vγ2Vδ2 T cells in response to HMBPP. IL-2, IL-15, and IL-21 have been shown to function as growth cytokines for HMBPP-activated Vγ2Vδ2 T cells (14, 23). In this study, we demonstrate that VIL-4 can promote apparent expansion of HMBPP-activated Vγ2Vδ2 T cells as well, and that the VIL-4-induced expansion is in the dose- and time-dependent manners. It is worth mentioning that an anti-IL-4 mAb cannot block VIL-4-induced expansion of Vγ2Vδ2 T cells. The anti-IL-4 mAb might interact with the epitope in the N-terminal, and therefore would not interfere with the ability of VIL-4 to bind to IL-4 receptor α-chain. Our data suggest that VIL-4 binds to IL-4 receptor α-chain, but engage a different signal pathway for promoting proliferation/expansion of Vγ2Vδ2 T cells. IL-4 receptor is a heterodimer comprised of a high-affinity subunit α-chain and common γ-chain. IL-4 carries two crucial residues for its binding to IL-4 receptor α-chain: Glu9 at helix A and Arg88 at helix C (52, 53). IL-4 also has three residues Tyr124, Arg121, and Ser125 that are important for interaction with IL-4 receptor common γ-chain and subsequent signal transduction without affecting the binding to α-chain subunit (54). Like IL-4, VIL-4 carries both Glu9 and Arg88, and therefore likely binds to IL-4 receptor α-chain. However, since VIL-4 does not carry Tyr124, Arg121, or Ser125 due to the frame-shift caused by two insertions, VIL-4 may exploit a signal pathway different from IL-4 while binding to IL-4 receptor α-chain. The fact that VIL-4 carries the unique proline-rich motif at C-terminal suggests that VIL-4 may readily engage the kinase-related signaling pathway for induction of proliferation and expansion of Vγ2Vδ2 T cells. VIL-4-expanded Vγ2Vδ2 T cells after HMBPP stimulation represent heterologous effector cells, since they are able to produce IFN-γ, TNF-α, and IL-4. Although in vitro and in vivo studies have shown that activated γδ T cells are able to produce IFN-γ, TNF-α, and IL-4 (14, 53), the capacity of IL-4-expanded Vγ2Vδ2 T cells to produce Th1-like cytokines has not been well described. Although it is not surprising that VIL-4 induces IL-4-producing Vγ2Vδ2 T cells in response to HMBPP, it is worth mentioning that IFN-γ- and TNF-α-producing cell subpopulations exist in HMBPP-activated VIL-4-expanded Vγ2Vδ2 T cells. Given the possibility that IFN-γ and TNF-α play a role in antimycobacterial immunity in mice (55, 56), HMBPP-stimulated VIL-4-expanded Vγ2Vδ2 T cells may contribute to development of humoral and cellular immune responses against mycobacterial infections. Further in vivo studies are needed to address this presumption. We thank B. Paige, J. Graves, and Dr. K. Hagen for technical assistance with flow cytometry. 1 This work was supported by the National Institutes of Health R01 Grants HL64560 and RR13601 (both to Z.W.C.). 3 Abbreviations used in this paper: VIL-4, variant IL-4; HMBPP, (E)-4-hydroxy-3-methyl-but-2-enyl pyrophosphate; BCG, bacillus Calmette-Guérin. Ferrick, D. A., M. D. Schrenzel, T. Mulvania, B. Hsieh, W. G. Ferlin, H. Lepper. 1995. Differential production of interferon-γ and interleukin-4 in response to Th1- and Th2-stimulating pathogens by γ δ T cells in vivo. Nature 373: 255-257. Brown, M. A., J. H. Pierce, C. J. Watson, J. Falco, J. N. Ihle, W. E. Paul. 1987. B cell stimulatory factor-1/interleukin-4 mRNA is expressed by normal and transformed mast cells. Cell 50: 809-818. MacGlashan, D., Jr, J. M. White, S. K. Huang, S. J. Ono, J. T. Schroeder, L. M. Lichtenstein. 1994. Secretion of IL-4 from human basophils: the relationship between IL-4 mRNA and protein in resting and stimulated basophils. J. Immunol. 152: 3006-3016. Paul, W. E.. 1991. Interleukin-4: a prototypic immunoregulatory lymphokine. Blood 77: 1859-1870. Swain, S. L., A. D. Weinberg, M. English, G. Huston. 1990. IL-4 directs the development of Th2-like helper effectors. J. Immunol. 145: 3796-3806. Sorg, R. V., J. Enczmann, U. R. Sorg, E. M. Schneider, P. Wernet. 1993. Identification of an alternatively spliced transcript of human interleukin-4 lacking the sequence encoded by exon 2. Exp. Hematol. 21: 560-563. Atamas, S. P., J. Choi, V. V. Yurovsky, B. White. 1996. An alternative splice variant of human IL-4, IL-4 δ 2, inhibits IL-4-stimulated T cell proliferation. J. Immunol. 156: 435-441. Alms, W. J., S. P. Atamas, V. V. Yurovsky, B. White. 1996. Generation of a variant of human interleukin-4 by alternative splicing. Mol. Immunol. 33: 361-370. Arinobu, Y., S. P. Atamas, T. Otsuka, H. Niiro, K. Yamaoka, H. Mitsuyasu, Y. Niho, N. Hamasaki, B. White, K. Izuhara. 1999. Antagonistic effects of an alternative splice variant of human IL-4, IL-4δ2, on IL-4 activities in human monocytes and B cells. Cell. Immunol. 191: 161-167. Dieli, F., D. Vermijlen, F. Fulfaro, N. Caccamo, S. Meraviglia, G. Cicero, A. Roberts, S. Buccheri, M. D'Asaro, N. Gebbia, et al 2007. Targeting human γδ T cells with zoledronate and interleukin-2 for immunotherapy of hormone-refractory prostate cancer. Cancer Res. 67: 7450-7457. Beetz, S., L. Marischen, D. Kabelitz, D. Wesch. 2007. Human γ δ T cells: candidates for the development of immunotherapeutic strategies. Immunol. Res. 37: 97-111. Garcia, V. E., P. A. Sieling, J. Gong, P. F. Barnes, K. Uyemura, Y. Tanaka, B. R. Bloom, C. T. Morita, R. L. Modlin. 1997. Single-cell cytokine analysis of γ δ T cell responses to nonpeptide mycobacterial antigens. J. Immunol. 159: 1328-1335. Altincicek, B., J. Moll, N. Campos, G. Foerster, E. Beck, J. F. Hoeffler, C. Grosdemange-Billiard, M. Rodriguez-Concepcion, M. Rohmer, A. Boronat, et al 2001. Cutting edge: human γ δ T cells are activated by intermediates of the 2-C-methyl-D-erythritol 4-phosphate pathway of isoprenoid biosynthesis. J. Immunol. 166: 3655-3658. Belmant, C., E. Espinosa, R. Poupot, M. A. Peyrat, M. Guiraud, Y. Poquet, M. Bonneville, J. J. Fournie. 1999. 3-Formyl-1-butyl pyrophosphate A novel mycobacterial metabolite-activating human γδ T cells. J. Biol. Chem. 274: 32079-32084. Kuzuyama, T.. 2002. Mevalonate and nonmevalonate pathways for the biosynthesis of isoprene units. Biosci. Biotechnol. Biochem. 66: 1619-1627. Wei, H., D. Huang, X. Lai, M. Chen, W. Zhong, R. Wang, Z. W. Chen. 2008. Definition of APC presentation of phosphoantigen (E)-4-hydroxy-3-methyl-but-2-enyl pyrophosphate to Vγ2Vδ2 TCR. J. Immunol. 181: 4798-4806. Huang, D., Y. Shen, L. Qiu, C. Y. Chen, L. Shen, J. Estep, R. Hunt, D. Vasconcelos, G. Du, P. Aye, et al 2008. Immune distribution and localization of phosphoantigen-specific Vγ2Vδ2 T cells in lymphoid and nonlymphoid tissues in Mycobacterium tuberculosis infection. Infect. Immun. 76: 426-436. Boullier, S., Y. Poquet, T. Debord, J. J. Fournie, M. L. Gougeon. 1999. Regulation by cytokines (IL-12, IL-15, IL-4 and IL-10) of the Vγ9Vδ2 T cell response to mycobacterial phosphoantigens in responder and anergic HIV-infected persons. Eur. J. Immunol. 29: 90-99. Vermijlen, D., P. Ellis, C. Langford, A. Klein, R. Engel, K. Willimann, H. Jomaa, A. C. Hayday, M. Eberl. 2007. Distinct cytokine-driven responses of activated blood γδ T cells: insights into unconventional T cell pleiotropy. J. Immunol. 178: 4304-4314. Qiu, L., D. Huang, C. Y. Chen, R. Wang, L. Shen, J. Estep, R. Hunt, N. L. Letvin, G. Du, Z. W. Chen. 2008. Severe TB induced unbalanced gene networks, over-expressions of IL-22, MIP-1α, CCL27, IP-10, CCR4, CCR5, CXCR3, PD1, PDL2, IL-3, IFN-β, Tim1, TLR2, but low cellular immune responses. J. Infect. Dis. 22: 2241-2250. Shen, Y., L. Shen, P. Sehgal, D. Huang, L. Qiu, G. Du, N. L. Letvin, Z. W. Chen. 2004. Clinical latency and reactivation of AIDS-related mycobacterial infections. J. Virol. 78: 14023-14032. Huang, D., L. Qiu, R. Wang, X. Lai, G. Du, P. Seghal, Y. Shen, L. Shao, L. Halliday, J. Fortman, et al 2007. Immune gene networks of mycobacterial vaccine-elicited cellular responses and immunity. J. Infect. Dis. 195: 55-69. Villinger, F., S. S. Brar, A. Mayne, N. Chikkala, A. A. Ansari. 1995. Comparative sequence analysis of cytokine genes from human and nonhuman primates. J. Immunol. 155: 3946-3954. Watanabe, S., M. Kondo, K. Takatsu, K. Sugamura, K. Arai. 1995. Involvement of the interleukin-2 receptor γ subunit in interleukin-4-dependent activation of mouse hematopoietic cells and splenic B cells. Eur. J. Immunol. 25: 126-131. Kruse, N., T. Lehrnbecher, W. Sebald. 1991. Site-directed mutagenesis reveals the importance of disulfide bridges and aromatic residues for structure and proliferative activity of human interleukin-4. FEBS Lett. 286: 58-60. Ceroni, A., A. Passerini, A. Vullo, P. Frasconi. 2006. DISULFIND: a disulfide bonding state and cysteine connectivity prediction server. Nucleic Acids Res. 34: W177-W181. Ohara, J., J. E. Coligan, K. Zoon, W. L. Maloy, W. E. Paul. 1987. High-efficiency purification and chemical characterization of B cell stimulatory factor-1/interleukin 4. J. Immunol. 139: 1127-1134. Le, H. V., L. Ramanathan, J. E. Labdon, C. A. Mays-Ichinco, R. Syto, N. Arai, P. Hoy, Y. Takebe, T. L. Nagabhushan, P. P. Trotta. 1988. Isolation and characterization of multiple variants of recombinant human interleukin 4 expressed in mammalian cells. J. Biol. Chem. 263: 10817-10823.
van Kimmenade, A., M. W. Bond, J. H. Schumacher, C. Laquoi, R. A. Kastelein. 1988. Expression, renaturation and purification of recombinant human interleukin 4 from Escherichia coli. Eur J. Biochem. 173: 109-114. Green, M. R.. 1986. Pre-mRNA splicing. Annu. Rev. Genet. 20: 671-708. Tsytsikov, V. N., V. V. Yurovsky, S. P. Atamas, W. J. Alms, B. White. 1996. Identification and characterization of two alternative splice variants of human interleukin-2. J. Biol. Chem. 271: 23055-23060. Kestler, D. P., S. Agarwal, J. Cobb, K. M. Goldstein, R. E. Hall. 1995. Detection and analysis of an alternatively spliced isoform of interleukin-6 mRNA in peripheral blood mononuclear cells. Blood 86: 4559-4567. Korte, A., A. Moricke, B. Beyermann, J. Kochling, T. Taube, C. Kebelmann-Betzing, G. Henze, K. Seeger. 1999. Extensive alternative splicing of interleukin-7 in malignant hematopoietic cells: implication of distinct isoforms in modulating IL-7 activity. J. Interferon. Cytokine Res. 19: 495-503. Anderson, D. M., S. D. Lyman, A. Baird, J. M. Wignall, J. Eisenman, C. Rauch, C. J. March, H. S. Boswell, S. D. Gimpel, D. Cosman, et al 1990. Molecular cloning of mast cell growth factor, a hematopoietin that is active in both membrane bound and soluble forms. Cell 63: 235-243. Gautherot, I., N. Burdin, D. Seguin, L. Aujame, R. Sodoyer. 2002. Cloning of interleukin-4 δ2 splice variant (IL-4δ2) in chimpanzee and cynomolgus macaque: phylogenetic analysis of δ2 splice variant appearance, and implications for the study of IL-4-driven immune processes. Immunogenetics 54: 635-644. Perkins, H. D., B. H. van Leeuwen, C. M. Hardy, P. J. Kerr. 2000. The complete cDNA sequences of IL-2, IL-4, IL-6 and IL-10 from the European rabbit (Oryctolagus cuniculus). Cytokine 12: 555-565. Yatsenko, O. P., M. L. Filipenko, E. A. Khrapov, E. N. Voronina, V. A. Kozlov, S. V. Sennikov. 2004. Alternative splicing of mRNA of mouse interleukin-4 and interleukin-6. Cytokine 28: 190-196. Waldvogel, A. S., M. F. Lepage, A. Zakher, M. P. Reichel, R. Eicher, V. T. Heussler. 2004. Expression of interleukin 4, interleukin 4 splice variants and interferon γ mRNA in calves experimentally infected with Fasciola hepatica. Vet. Immunol. Immunopathol. 97: 53-63. Rhodes, S. G., J. Sawyer, A. O. Whelan, G. S. Dean, M. Coad, K. J. Ewer, A. S. Waldvogel, A. Zakher, D. J. Clifford, R. G. Hewinson, H. M. Vordermeier. 2007. Is interleukin-4δ3 splice variant expression in bovine tuberculosis a marker of protective immunity?. Infect. Immun. 75: 3006-3013. Pawson, T., J. D. Scott. 1997. Signaling through scaffold, anchoring, and adaptor proteins. Science 278: 2075-2080. Mayer, B. J.. 2001. SH3 domains: complexity in moderation. J. Cell Sci. 114: 1253-1263. Kay, B. K., M. P. Williamson, M. Sudol. 2000. The importance of being proline: the interaction of proline-rich motifs in signaling proteins with their cognate domains. FASEB J. 14: 231-241. Brenner, M. B., J. McLean, D. P. Dialynas, J. L. Strominger, J. A. Smith, F. L. Owen, J. G. Seidman, S. Ip, F. Rosen, M. S. Krangel. 1986. Identification of a putative second T-cell receptor. Nature 322: 145-149. Carr, C., S. Aykent, N. M. Kimack, A. D. Levine. 1991. Disulfide assignments in recombinant mouse and human interleukin 4. Biochemistry 30: 1515-1523. Vaz, D. C., J. R. Rodrigues, W. Sebald, C. M. Dobson, R. M. Brito. 2006. Enthalpic and entropic contributions mediate the role of disulfide bonds on the conformational stability of interleukin-4. Protein Sci. 15: 33-44. Kruse, N., B. J. Shen, S. Arnold, H. P. Tony, T. Muller, W. Sebald. 1993. Two distinct functional sites of human interleukin 4 are identified by variants impaired in either receptor binding or receptor activation. EMBO J. 12: 5121-5129. Wang, L., H. Das, A. Kamath, J. F. Bukowski. 2001. Human V γ 2V δ 2 T cells produce IFN-γ and TNF-α with an on/off/on cycling pattern in response to live bacterial products. J. Immunol. 167: 6195-6201. Schnarr, B., J. Ezernieks, W. Sebald, A. Duschl. 1997. IL-4 receptor complexes containing or lacking the γ C chain are inhibited by an overlapping set of antagonistic IL-4 mutant proteins. Int. Immunol. 9: 861-868. Andersen, P.. 1997. Host responses and antigens involved in protective immunity to Mycobacterium tuberculosis. Scand. J. Immunol. 45: 115-131.